From the 1st until the 6th of July 2010, 150 young Europeans from 35 different European countries came together in Geel (Belgium) to learn and exchange knowledge and experience about biodiversity. Why biodiversity? 2010 has not only been internationally promoted as the International Year of Biodiversity, it is also the year of the Countdown 2010 target, the promise to halt the tremendous pace of biodiversity loss by 2010. However, biodiversity loss has not been halted. Concerned about their future, the 150 participants want to urge European policy makers to act now and make this year a turning point in biodiversity policy. The result of YouPEC was the formulation of the Youth Perspective on Biodiversity. In this declaration, the participants urge for action on biodiversity. 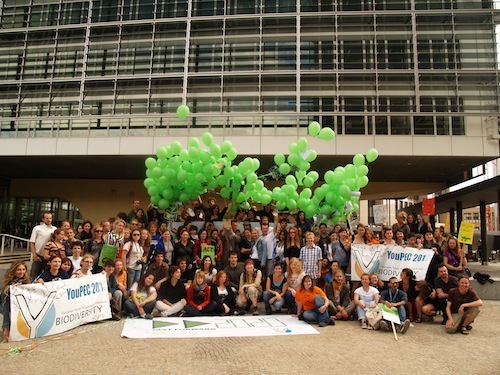 The participants presented the declaration at the EU Commission building in Brussels, while each of them was holding an image of Europe’s unique species and ecosystems attached to a balloon. To symbolise their concerns regarding the rapidly accelerating rate of biodiversity loss, they stopped the balloons from flying and handed them over to the European Commissioner for Environment Janez Potoènik. YouPEC was an amazing event that inspired all the participants, to start acting to protect and restore Europe’s biodiversity. But they cannot do this alone, they need politicians to act. Europe’s policy makers need to take the valuable suggestions of the young Europeans into account, constitute a more ambitious and stronger European biodiversity policy, and ensure that there is still a reason for youth to be the leaders of tomorrow. ACT NOW!